A new report out from Oil Change International, in partnership with 11 other local, regional, and national organizations, shows that current projections for U.S. natural gas production – fueled by a boom in the Appalachian Basin – will lock in enough carbon to bust through agreed climate goals. 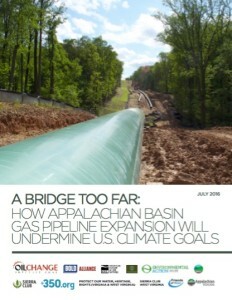 The report, entitled, “A Bridge Too Far: How Appalachian Basin Gas Pipeline Expansion Will Undermine U.S. Climate Goals,” takes an extensive look at the climate implications of proposed natural gas infrastructure in the Appalachian Basin. All new energy projects must pass a climate test to prove their viability in a climate safe world. These new gas pipelines fail that test. Although I would stand to financially profit from this Pipeline expansion because of some Forexco shares I own – I am against this expansion. We cannot afford to destroy those promises we made in Paris. It is clear to me and many others that the continued expansion of gas pipelines will take our country well beyond the agreed upon limits at the 2016 Climate Summit. This is totally unacceptable for our country and the world! Additionslly most of these pipelines are projected to send gas overseas, and in the meantime will degrade the environment and trample on the rights of landowners for a healthy environment for t heir families. Solar and wind power are the smartest way to the future. Not to mention the amount of carbon that will be produced in the exportation process. Natural gas has been touted as a transition energy source, but what happens when it is deemed too profitable to stop extraction and exportation. I think WNY needs to start looking at the German energy playbook as to where and how we source our energy. I’m willing to bet that a vast majority, on the right and left, would be willing to seriously consider it. This is just another marker of how owned our representatives are… Big oil, Big Pharma, Big Banks etc, and the Big Banks have bitten us very hard, very recently… I guess as a bunch of no-brained, forgetful, mere merkin citizens that we deserve this kind of representation? When was the last time you dialed a 202 prefix? Get to it! (Oh, 202 is the area code for Washington DC) See if you can figure out who to call there. keep it in the ground.we have enough problems above ground! Our problem is getting this information to the general public. We, that have been watching the fracking industry knew this was coming. The hearings on exporting LNG were all one sided, no apposing views. Obama gave Hillary the Gobal Initiative Dept. to develope it in Europe. They are lizards singing pretty birds songs. Once our canaries start dying en mass it will be too late. Recommendation for a “climate test” is far too weak. Fracking and pipelines fail climate tests by definition. We need to advocate “keep it in the ground” – a moratorium on all fossil extraction on public lands and denial of federal and State permits for all fossil projects on private lands. One more point – pipeline and fracking opponents are putting way to much energy in focusing on federal FERC and USACE – and virtually none on State government powers under the CLean Water Act Section 401. Additionally, after a HUGE legal win in the Pennsylvania Supreme Court in a decision that rejected a Sate preemption law and upheld local government powers to regulate fracking, there needs to be more attention paid on local bans and land use restrictions in PA. Instead, the PA activists seem diverted to FERC-ing off.